and to respect the Constitutional rights of all people to liberty, equality, and justice. 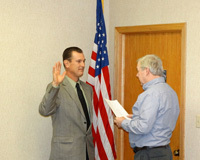 Chief DeHaan has served the City of Oregon as a police officer for 21 years. He was hired as a full-time officer in 1996. He worked his way through the ranks of the Oregon Police Department. From Patrol Officer, Corporal, Sergeant, Detective, Lieutenant, and finally appointed as Chief of Police in 2005. 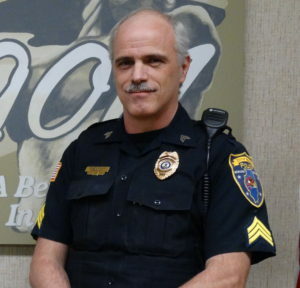 Chief DeHaan has a Bachelor’s Degree in Law Enforcement Administration from WIU. On June 20th 2008 he completed the requirements and received a Masters of Arts Degree in Public Administration from Northwestern University. 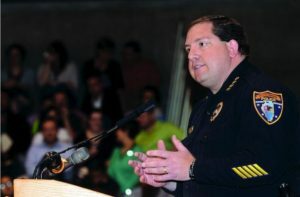 Chief DeHaan is also a graduate of Northwestern University’s School of Police Staff and Command #192 where he served as Vice-President of his class. 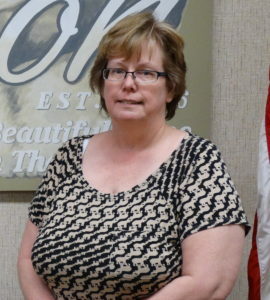 Chief DeHaan is currently on the board of directors for the Lee, Ogle, Carroll County CASA board, an organization that serves abused and neglected children in our communities. Mary is our Administrative Assistant. She has numerous tasks that she performs for the public. From records keeping, to billing, ordinance violation tracking, and many other things. She does a great job keeping everything running smoothly. Lt. Melville currently holds the position of Detective. Lt. Melville handles a majority of the Felony and Drug Investigations for the Oregon Police Department. Lt. Melville is our Field Training Officer Supervisor, a certified firearms instructor, and a gang crime expert. 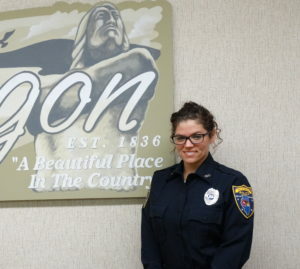 Sergeant Cropp joined the Oregon Police Department in January of 2000. Prior to employment with us he worked for the Freeport Police Department. 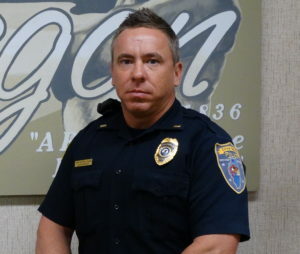 Sergeant Cropp is a certified firearms instructor, and field training officer. Sgt. Brooks was our K-9 handler. He continues his duties as Evidence Room Supervisor, Shift Supervisor and field training officer. Sgt. Brooks is also a certified commercial vehicle enforcement officer. Officer Kalnins is originally from Oregon where he graduated from Oregon High School in 2001. Officer Kalnins was previously employed as a Correctional Officer with the Ogle County Sheriff’s Department. Officer Kalnins is our control tactics instructor. He is also a member of the ILEAS Mobile Field Force. 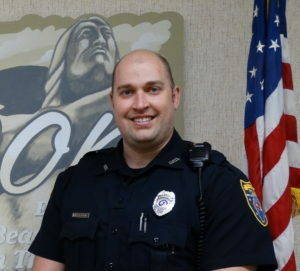 Officer Dominski started his career as a Oregon Park District Police officer. 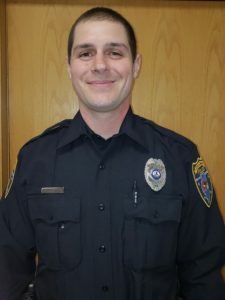 He then worked as a correctional officer for the Ogle County Sheriff’s Department before being appointed as a full-time officer for the Oregon Police Department. 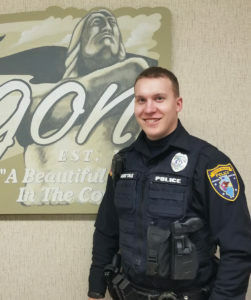 Officer Dominski is currently a member of the Ogle County Emergency Response team. Officer Dominski is also bike patrol officer. Officer Mattas was hired in November of 2016. He attended the Suburban Law Enforcement Academy (SLEA) at the College of DuPage. Officer Mattas graduated from the academy on March 31st 2017 and is currently assigned to patrol. Kristine was hired on 09/11/18 and will attend the Suburban Law Enforcement Academy from September 2018 until December of 2018. 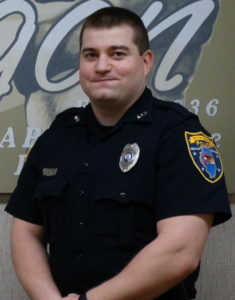 Josh was hired on 11/27/18 and will attend the Southwestern Police Academy in March. In the mean time Josh has completed his State of Illinois firearms certification and will be with Field Training Officers. Officer Ketter is a full time deputy of the Ogle County Sheriff’s Department. He has worked in a part-time capacity for our department for several years. Officer Lehman has over 30 years of experience in Law Enforcement. 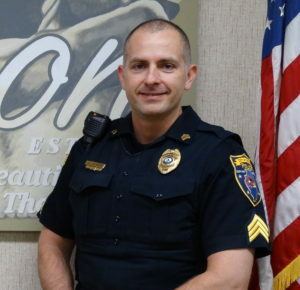 He retired as the Chief of Police in Franklin Grove and has agreed to work part-time of Oregon. We are happy to have his experience on our team. 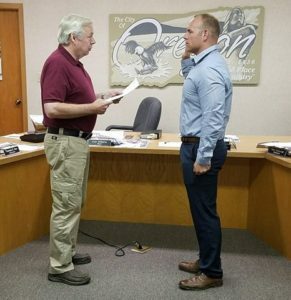 Adam was sworn in as a Part-time officer. He is a full-time fireman for the Rockford Fire Department.